Rosacea is a common skin condition which begins with increased facial flushing and may develop into permanent facial redness. Symptoms include coarsened skin, visible blood vessels, and bumps or pustules that look like acne. There is no complete cure for this condition, and it may take a while for a physician to find a combination of treatments that at least helps control symptoms. A combination of sulfacetamide and sulfur has long been used as a treatment for acne, and it has recently been recognized as effective in controlling rosacea as well. Until recently, patients often did not choose this option because of the strong sulfur smell, but new products, which include creams, gels, lotions, and cleansers, now successfully disguise the smell. This medication is not recommended for anyone who is allergic to sulfur. Antibiotics may be applied to the skin or taken in pill form. Since doctors don't know what, if any, bacteria causes rosacea, it's not clear which antibiotic is best or even why they seem to help. Many doctors think that the anti-inflammatory properties of antibiotics, not their ability to kill bacteria, are the reason for their effectiveness in rosacea treatment. Antibiotics are often prescribed to be taken by mouth at first, because pills seem to work faster than creams. However, creams and gels can then be used for long-term care. Studies have shown that metronidazole, taken by mouth, helps decrease pustules. Metronidazole cream is helpful in mild cases or may be prescribed along with another medicine. Metrogel 1% is a clear gel that contains metronidazole and is helpful to some people with rosacea. There are many other potentially useful antibiotics, and a doctor can help guide you to the one most likely to help. When used in combination with antibiotics, glycolic acid can help manage the symptoms of rosacea. Glycolic peels have to be applied by a physician; this treatment leaves the skin red for a few hours as it removes layers of skin. There are also lower-concentration glycolic acid skin washes and creams that a dermatologist may add to the treatment plan to better manage rosacea. Medicines that decrease the strength of immune reactions are sometimes used to reduce the redness and swelling of rosacea. They are generally used when other treatments have failed. Tacrolimus (brand name Protopic), which is available as a topical ointment, is one choice. However, there have been cases of exacerbation of the condition with use of this medication. Steroids, which also decrease inflammation, should be avoided if possible because long-term steroid use can cause a rosacea-like condition. 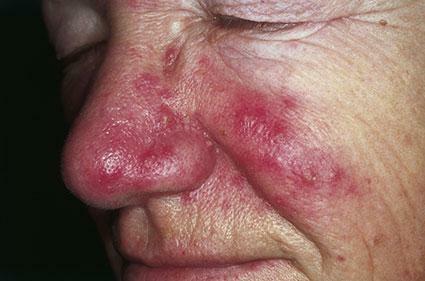 Retinoid medications may be used to treat severe cases of rosacea. The acne pill isotretinoin, (brand name Accutane) and the topical form, retinoin (sold as Retin-A), may also be helpful, although Retin-A may be too harsh for some skin. A dermatologist has to closely follow patients who use these medications because of the risk of significant and potentially serious side effects. Although there is not a lot of conclusive scientific evidence about the effectiveness of these therapies, some people turn to natural treatments to manage their rosacea. Zinc oxide is an anti-inflammatory mineral used in popular mineral powder makeup. In oral form, zinc oxide has also been suggested as a treatment for rosacea. However, a more recent study did not show much effect on rosacea, so more research is needed to clarify the issue. If you are interested in trying an alternative therapy for this condition, you should discuss it with your physician before starting; there is also a risk of interactions with any other medications that you may be taking. There are several cosmetic procedures that your doctor may use to treat your rosacea. These treatments work on certain types of rosacea so It depends on the type of skin symptoms that you have. Talk to your dermatologist or skin care doctor about your options. Laser treatment can destroy unsightly telangectasias, which are tangles of blood vessels near the skin's surface. This treatment can also help improve the texture of the skin and decrease flushing. Multiple treatments over several months to a year may be required. Unfortunately, insurance usually does not cover these treatments. If one of your symptoms is thickened skin, dermabrasion can be used to reshape the surface of your skin. This treatment can improve the appearance of scars and skin by smoothing out the area. Your doctor uses a surgical tool that sands down the upper layers of skin; when the skin grows back, it is smoother. Low-powered electrical current can be used to treat the visible blood vessels in this condition. The area has to be numbed, and the treated area has to be scraped after the therapy. It usually requires more than one treatment to be effective, and you may have some redness and swelling in the area for a few days. Rosacea most commonly affects facial skin, and sometimes the eyes are involved. Antibiotics are the mainstay of treatment for eye involvement, along with careful hygiene. Cleaning eyelids several times a day with gentle cleanser may help. To avoid making the condition worse, it's important to discuss eye care with your doctor. Every person's experience with rosacea is different. Many people have intermittent flare ups, and some find that the condition continues to worsen over time. Once medication is started, it may take a month or two before you see any improvement. People who continue treatment at a maintenance level seem to have fewer flare ups than people who stop treatment. Visit Rosacea.org for more information.